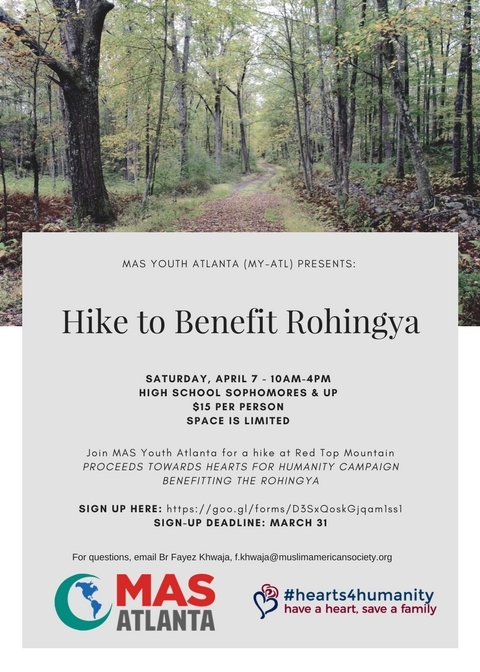 Join us for a springtime hike to benefit the Rohingya Muslims. The cost per person is $15, of which $10 will go as donation towards the MAS Atlanta Hearts For Humanity campaign. We will meet at RCM at 10 AM on Saturday. Please bring a bagged lunch and water. NOTE: You are not considered registered until we have received your payment. We will not be taking on-site registration or payments. Feel free to donate more for the cause! !